Trailhead Upper (Kananaskis) Lake parking lot at the end of Kananaskis Lakes Trail (Hwy. 40). An elevation profile of the Meadow section can be viewed here (12 KB picture appears in a new window). This map (58 KB), based on a Parks Canada pdf brochure, shows the trails and campsites for the parts of the route in Banff National Park and Mt. Assiniboine Provicial Park. 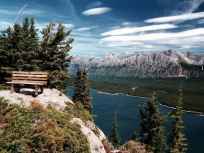 See The Kananaskis Country Trail Guide for a detailed description. A pdf map of Peter Lougheed Provincial Park is available, and a section of the map (26 KB), with the Days 1 and 2 routes added, can be viewed here. Click here to view the corresponding portion of the topographic map, Kananaskis Lakes 82 J/11. After following the Upper Lake trail for about 1½ hours, you will notice a basic hiker's directional sign on the trail. The sign doesn't indicate that the trail to Hidden Lake begins here, but you should be able to find the faint beginnings of a path that heads west (this was the situation in 1997). There is no obvious outlet stream from Hidden Lake to follow, but sometimes, early in the season, the Upper Lake trail near the sign is flooded by the Hidden Lake overflow. The trail around the east side of Hidden Lake is truly wretched, as it is covered with deadfall and is easy to lose. Apparently, the lake is empty in the fall and one can cross the mud flats to the south end. However, I have only visited in the summer and have been forced into the bush. If you lose the trail, head for the shoreline at the far (south) end where the deadfall ends and the trail becomes well-defined. After a short climb up from the lake, the trail seems to fade in an open, rocky meadow, but if you head left toward the scree slope coming down from Mt. Sarrail, you should be able to find the trail that ascends to the Fossil Falls headwall. The trail grade is not excessively steep, but there is a slight degree of exposure due to the steepness of the slope itself. I have heard that a fatality occurred here. However, the risk is probably greater on the descent, which suggests that the Northover Ridge route, if done as a separate trip, is probably safer to do in the clockwise direction. Finally, after scrambling over some easy ledges, the trail reaches the top of the headwall and levels out in a beautiful larch meadow. It takes about 4 hours to reach this point. The trail continues to meander across the meadow, eventually approaching Aster Creek and the last, short headwall below Aster Lake (2,292 m (7,518')). Before 1998, it was common to hike up to the lake, ford its mouth to the other side and camp. However, there is now an official campsite next to the creek, below the headwall, that must be reserved in advance. This website has several fine photos of the area. Another account of the Northover Ridge hike, along with several excellent photos, may be found here. A detailed trip report that includes descriptions of scrambles up Mts. Northover, Sarrail et al is provided here. Assuming that you have camped at the new campsite, Day 2 begins with a moderate ford of icy Aster Lake at its mouth. In 1997, I camped at the old site, seen in the photo below, and next morning as I was packing up a small grizzly bear poked its head out of the bushes for a second and promptly disappeared in the direction I was headed. This was one of the three times I have seen a bear in the backcountry in twenty+ years of hiking. In any event, a faint trail heads up Aster valley on the west side of the lake, towards the saddle between Warrior Mtn. and the S.E. ridge of Mt. Northover. Aim for the vicinity of the col at grid ref. 252040 (Kananaskis Lakes 82 J/11). As the col comes into view above treeline, the trail becomes better defined, but eventually it ends up on some unpleasantly steep slopes. Continue to the col on the easy ground (often, firm snow) in the middle of the approach. Aster Lake and Warrior Mtn. At an elevation of 2,591 m (8,500') on the Continental Divide, the unnamed col provides a clear view of the next objective, the col (grid ref. 242054) just west of the summit of Mt. Northover. The trail is well-defined, but even when it is snow-covered, the route is obvious. Northover col (2,804 m (9,200') is the start of the highest maintained hiking trail in the Canadian Rockies, and for the next 2.5 km the route is right on the divide. To begin, head left from the col and scramble up a short scree slope to find the first cairn on the ridge. The ridge is comfortably wide at the beginning, but it gradually narrows as you approach the high point. The drop-off to the Palliser valley is quite precipitous, but I wouldn't rate any part of the route as exposed. However, there are one or two points where one must be cautious; it would be easy to lose one's footing due to the strong winds that often sweep the ridge. The high point, at 2,845 m (9,332'), offers spectacular views in all directions, especially of the Royal Group, Mt. Joffre, Three Isle Lake and Mt. Sir Douglas. This picture from the guide was taken from near the summit, looking back to Mt. Northover (centre-left skyline) and the glaciated north face of Mt. Joffre (right skyline). There are some excellent pictures of the Northover Ridge trip on Bennett Wong's site. From the summit, the trail descends to the col at grid ref. 221065. Turn right, plunge down easy scree or snow to the open meadows, and hike to Three Isle Lake camp. The trail from Three Isle Lake down to Forks camp is routine, as is the initial climb up the Turbine Canyon trail. (Note that it is possible to access this part of the route from the North Interlakes parking lot which is 6.7 km from Forks.) Eventually, the trail levels out and crosses a very scenic sub-alpine meadow, passing by Lawson Lake and arriving at Turbine Canyon campsite beside Maude Brook. It may appear to be more direct to hike from Three Isle Lake and cross South Kananaskis Pass, then traverse the shoulder of Mt. Beatty and cross North Kananaskis Pass to reach Turbine Canyon. However, this is not recommended due to the heavy bush on the B.C. side and the steep approach to North Kananaskis Pass. The route described above is easier, quicker and more scenic. In fact, if you are interested in an excellent 2 or 3 day trip, start at North Interlakes parking lot and hike to Turbine camp. From there, North Kananaskis Pass (1.8 km) and the Haig Glacier are easy objectives. The trail to the latter, the site of summer cross-country skiing training camps, can be found by walking eastward through the campsite to the stream that enters Maude Brook from the north. The trail begins directly across the stream. This day begins with an easy hike up to Maude Lake and North Kananaskis Pass (2,368 m (7,767')). Scramble up the north side of the pass for a striking view of the Royal Group to the west. The trail down to LeRoy Creek in Height of the Rockies Provincial Park is very steep near the top and brushy throughout, but it is generally easy to follow. After about 3 km, the trail crosses LeRoy Creek (rock-hop) and continues for another 2 km on the other side until it ends at Palliser River, just above the Palliser/LeRoy junction. There is a space here for one or two tents, right beside LeRoy Creek, should it be necessary to camp. The next obstacle is Palliser River, which is split into two channels at this point. On my last visit in 1997, the first channel was spanned by a fallen tree, the second was an easy ford. I have also crossed here in early July with no problems. In case you are approaching the ford from the opposite direction, there is a prominent red blaze on a tree on the west side of the Palliser. Once you are across, head westward away from the river and jump across a boggy pond. After a bit of searching in the grassy meadow, you should be able to discern a faint trail that veers off to the right and heads up the valley. The trail soon becomes well-defined and continues at an easy grade for about another 2 km until it crosses the Palliser to its east side (easy ford). If you are referring to the Kananaskis Lakes 82 J/11 topo map, note that part of the upper Palliser trail is misplaced, as is the trail around Lawson Lake, but the LeRoy Creek trail is marked correctly. Approximately 1 km after the ford, the trail becomes a series of steep switchbacks that end at a flat meadow with several camping options. However, there are more attractive sites a bit further up at the north end of Palliser Lake. The boundary marker and the summit of Palliser Pass on the Great Divide are just past the lake. Refer to the Palliser Pass page for details of the rest of the trail from the pass down to Leman Lake camp (US 18). A description of scrambles and camping spots in the area is provided here. Day 5 will be welcomed as a "rest" day, especially if you have hiked the Turbine-Leman section in one day. There are no significant elevation changes, but beginning at Bryant Creek you will notice much more traffic (hikers, cyclists and equestrians) than was present during the relative solitude of the previous 4 days. The descent of the Upper Spray is fairly routine, with no unbridged stream crossings, but on more than one occasion I have wandered off the trail between Leman camp and the Birdwood Creek warden cabin. This is not a major problem, as the general direction of travel is obvious, and the cabin is conspicuously located at the edge of an open meadow (the main trail passes about 100 m west of the cabin). Birdwood camp (US 15) is a few hundred metres north of the warden cabin, and is 4.7 km from Leman camp. The junction with the Bryant Creek trail is 14 km from Leman camp. Turn left to continue up the creek, or turn right to hike 6.2 km to the Mt. Shark parking lot, an alternate starting point for this portion of the GDT. Big Springs campsite (Br 7) is 3.5 km past the junction, and the cutoff to Marvel Lake camp (Br 13) is 3.6 km further. If you are camping at Br 13, it is worth scrambling up the rock pile at the north end of the camp for a good view of the mountains on the Upper Spray and of Mt. Eon above Marvel Lake. Mt. Assiniboine Provincial Park is accessible by a number of routes, but I have always entered via Wonder Pass instead of the lower Assiniboine Pass. The Wonder Pass route is more scenic, and if bad weather obscures the surrounding peaks you still have excellent views of Marvel Lake and its two feeder lakes, Gloria and Terrapin. Another option, one that I have not done, is to hike to Owl Lake (the cutoff is 1 km before the Br 13 cutoff) and Marvel Pass, and then descend to Marvel Lake and reconnect with the Wonder Pass trail. This route is described in Banff-Assiniboine: A Beautiful World, and it appears feasible to camp at Cabin Lake, just below Marvel Pass on the B.C. side. From Br 13, cross Bryant Creek on the bridge at the west end of the campsite and continue for about 1 km until you reach a clearing at the east end of Marvel Lake. A sign indicates the direction to the Wonder Pass trail, which is a short climb from the lake. Be sure to fill your water bottles at the campsite, since in most years there is no water on the trail until near the summit of Wonder Pass (2,395 m (7,856')). The descent from the pass is very pleasant through the Gog Lake meadows, which often feature an impressive alpine floral display. Mt. Assiniboine comes into view for the first time as you approach the 'village' (Naiset cabins, B.C. Parks and Assiniboine Lodge). The picture on the cover of Banff-Assiniboine: A Beautiful World was taken from the main trail near the main lodge and shows two of the lodge cabins and Lake Magog. Compare this with a picture taken by Walter Wilcox, published in the 1909 Canadian Alpine Journal. Most hikers stay at the campsite at the far end (in the picture) of the lake, but I prefer the relative seclusion of Og Lake. The Og Lake trail begins a few hundred metres past the main lodge; look for signs that point to Assiniboine Pass and Og Lake/Citadel Pass. It is only about an hour's easy hike to Og Lake, but if the weather and your legs are in good shape, I highly recommend the side trip to Og Pass and Windy Ridge. The trail to Og Pass splits off to the right from the main Og Lake trail and heads across an open meadow before climbing the forested slopes to the pass. At 5 km from the lodge, and just 300 m from Og Pass summit (2,420 m (7,938')), you should be able to find a trail heading left to Windy Ridge. However, if you do not wish to continue in that direction, the small lake at the Og summit is worth a visit. Soon after the start of the Windy Ridge leg, the trail arrives at an open bench that offers terrific views of the immediate surroundings, plus a distant view of the twin towers of Mt. Goodsir in Yoho National Park. One would not be missing too much scenery if time or other factors dictated against making the final, steep ascent to Windy Ridge, as the view into Banff Park from this lofty col is unremarkable (panorama photos here), despite the elevation (2,635 m (8,643')). In any case, the descent from the bench offers two options: return to Lake Magog on the trail, or scramble down the slope directly to Og Lake. The latter can be negotiated without too much difficulty, with the aid of a trekking pole. The campsite at Og Lake is one of my favourites. Mt. 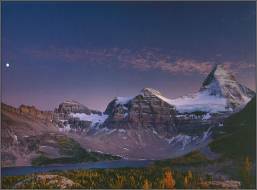 Assiniboine is especially impressive in the morning light, and the evening alpenglow on Og Mtn. can be quite striking. Since there is no visible inlet or outlet stream at the lake, this is one of the rare 'silent' camps in the Rockies, so you may hear the cooing and shuffling of the resident porcupines as they perform their nightly inspections. Unless you plan to spend another night at Og Lake and perhaps day-hike to Nub Peak, day 7 consists of a very scenic trip over Citadel Pass to a high campsite in Sunshine Meadows. Be sure to fill your water bottles at Og Lake, as there is no water for about 12 km, until near the summit of the pass. The first part of the route winds its way through the Valley of the Rocks, a unique area that reveals the devastation wrought by a massive rock slide. The next section involves a somewhat tedious descent through closed forest (stay right at the signed junction). Eventually, the trail begins a traverse of the open slopes of Golden Mtn. and heads toward the environs of Citadel Pass. Around the point where the trail begins its steep ascent to the pass, there is a poorly marked junction with a trail that heads left and descends to Porcupine camp and the Simpson River. Keep right, and plod up through the sweet-smelling vegetation until the first larch trees appear - a sure sign that you're approaching the sub-alpine zone. At the 'top of the stairs', the trail emerges onto a beautiful, tarn-studded meadow and proceeds at an easy grade for about 2 km to the last stunted trees at Citadel Pass (2,360 m (7,741')) and the boundary of Banff National Park. Just east of the pass you may notice a trail switchbacking up a grassy slope toward Fatigue Pass, an alternate point of access to the area. It is possible to hike from Banff townsite, up Brewster Creek and then up Fatigue Creek to Fatigue Pass in about 1½ days, but hikers have told me that the trail is rough, unscenic and includes numerous fords. Looking north from Citadel Pass, the most prominent sight is the glaciated peak of Mt. Ball. 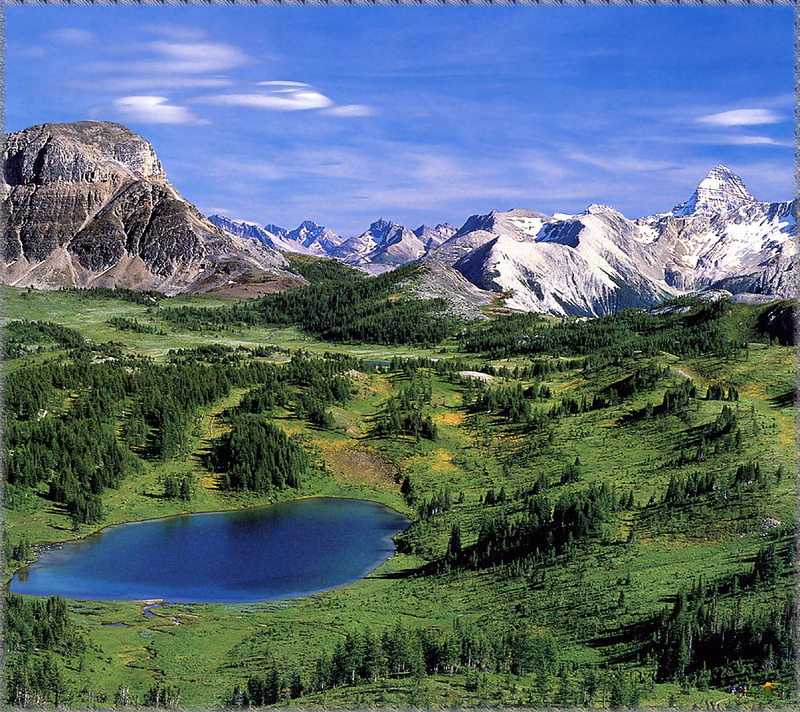 If you are day-hiking to the pass from Sunshine Village, the views of the Assiniboine group are not dramatically different from those available 4 km north at Quartz Hill ridge, but it is worth hiking the extra distance when the alpine flowers are in bloom. In contrast to the meadows between the village and the ridge, which seem to be mostly devoid of flowers, the slopes below Citadel Pass often feature lush floral displays. Another worthwhile destination is the small lake nestled against the north side of Citadel Peak. If you are heading north, the lake is visible from the trail at a point about 300 m below the pass. The campsite (Su 8) at Howard Douglas Lake is 3.5 km from Citadel Pass. This map, part of Banff 82 O4, shows the country between Citadel Pass and Healy Pass. The picture below gives a partial view of the pass, looking south from Quartz Hill ridge. Mt. Assiniboine is the prominent peak on the right, while the summit of the pass (not visible) is to the left of Citadel Peak, the mountain at the left side of the photo. Howard Douglas Lake is just below the ridge, and the campsite is just beyond the left edge of the picture, near the lake's outlet. Click on the thumbnail to view a compressed version of the original scan, or download the uncompressed scan (427 KB). The hike across Sunshine Meadows and Healy Pass is one of the best trips in the Canadian Rockies. Most of the day is spent above or near the treeline, and in contrast to the rest of the Great Divide Trail, the divide in this area is reached by a number of easy or imperceptible climbs. After crossing Quartz Hill ridge, just north of the campsite, the trail is practically level as it traverses the open meadows, even though the sight of Rock Isle Lake to the west indicates that you have crossed the divide and re-entered Mt. Assiniboine Park. Rock Isle Lake is an attractive spot to contemplate the beauty of the area, especially if you arrive before the crowds of day-hikers that take the bus up to Sunshine Village. For the next leg, take the Twin Cairns trail that branches north from the main trail at the north end of Rock Isle Lake. I prefer this route over the main trail to the village because the ski-lift structures are less visible and the floral displays are superior. In just over 2 km, you will reach the summit of Wawa Ridge (2,360 m (7,741')) and a signed intersection with the Meadow Park trail; turn right to Sunshine Village, or left to continue to Simpson Pass. Even if you're not heading to Simpson Pass, it's worth hiking in that direction for about one minute to a spectacular viewpoint overlooking the Healy Pass area. Unfortunately, the latter can only be reached by first making a rather steep descent to Simpson Pass. Views from Simpson Pass (2,135 m (7,003')) are limited, making it an unworthy destination by itself (except for fur-trade history buffs), but if you are planning to hike out to the Sunshine parking lot, this route may be preferable to the access road. For that option, turn east to hike the trail that eventually joins the Healy Creek trail and ends up at the parking lot, or continue straight ahead to Healy Pass. Additional photos of the area are available here. Heading toward Eohippus Lake, the trail crosses the divide again into Mt. Assiniboine Park and soon arrives at an unnamed lake, from which there is a good view of the Monarch Ramparts, the rock wall that extends from The Monarch peak to Healy Pass . Continuing around the south end of the lake, the trail makes a gradual ascent and within about 1 km Eohippus Lake appears at the bottom of the meadow. Unless you wish to descend to the lakeshore, turn right and head towards the south end of The Ramparts. However, if time permits, it is well worth walking around the lake, especially when the larches have turned gold. The south end of The Ramparts, visible in the background of these pictures, is easily reached from the lake via a grassy slope. Once you gain the top of the ridge, the easiest route follows the eastern, right-hand edge, avoiding some thick underbrush. Within a few minutes, you will arrive at the edge of a sheer cliff and get an excellent overview of Healy Pass. Beyond this point, a faint trail crosses a small gully, keeping to the eastern edge. Views continue to improve as you head north, but unlike Northover Ridge, The Ramparts remains comfortably wide. A small obelisk marks the beginning of a section of the route that is right on the Continental Divide. This is followed by a gradual descent to the summit of Healy Pass (2,330 m (7,642')). Although there are higher passes that are accessible by trail, few offer the quality of scenery in all directions that is available from Healy Pass. Even if the meadows are not in bloom, the normal trail up Healy Creek to the pass is one of the best day trips in the Rockies. After a lengthy stay at the pass, a quick descent through a meadow with some large timber brings you to the Egypt Lake outlet stream, across which is the campsite (E 13). The lake itself is an easy 15 min. walk from the campsite's west end. Day 9 begins with a brisk ascent to the Whistling Valley meadows and, usually, a greeting from its eponymous residents - whistling marmots. The flowers here may be less profuse than in Healy Pass, but there are many large, twisted larch trees to admire, plus there is the opportunity to visit Scarab Lake or its higher source, Mummy Lake. The trail to Scarab branches off the main trail at a signed junction, less than 2 km from E 13 and soon after the steep climb to the meadows. After about a 10 min. gradual descent, you will arrive at Scarab Lake. The trail to Mummy Lake begins just across the outlet of Scarab, but before heading up, be sure to follow the outlet to the left to a scary viewpoint at the edge of a precipice, a few hundred feet above Egypt Lake. Click here to view a map of the Egypt Lake area that is taken from a section of the Banff 82/O4 topographic map. It takes about 30 min. to get to Mummy Lake from the Scarab outlet. The trail crosses a rocky basin before making the final climb up a gully to the south end of Mummy. Mummy Lake is entirely above treeline and more scenic than its lower partner. As you approach Mummy, you will notice a pass on your left that invites further exploration. Although there is no trail to this unnamed col, which lies on the Continental Divide, it is an easy scramble and offers a route to Talc Lake and a subsequent return to Egypt Lake via Redearth Pass. The picture below was taken from just above the summit of the pass, on the slopes of "Sugarloaf Mtn." If you are not planning to visit the lakes, but are continuing on to Whistling Pass, it's a good idea to fill your water bottles at the campsite, as there is often no water before the north side of the pass. Whistling Pass (2,300 m (7,544')) offers excellent views of Haiduk Lake, Mt. Ball and Storm Mtn. However, if one were hiking in the opposite direction on a day trip from Shadow Lake Lodge, I would not recommend making the steep ascent to Whistling Pass. The view to the south from the pass is rather limited and, in contrast to the approach from Egypt Lake, the trail is rocky and often snow-covered. A more rewarding option for lodgers might include a visit to the south end of Haiduk Lake and perhaps a hike up to Ball Pass. The scenery around Haiduk Lake includes a beautiful set of waterfalls at the south end and a cotton-grass meadow near the outlet at the north end, which is less than 4 km from the campsite at Ball Pass Junction (Re 21). The final leg of the Meadow section involves a routine ascent to Ball Pass on the Continental Divide and the descent of Hawk Creek to the Banff-Radium Highway 93. The trail to the pass begins on the north side of the creek that runs through Re 21 campsite. After a short, steep section near the top, the trail levels out and is virtually flat for about 200 m through the summit of Ball Pass (2,210 m (7,249'). Distant views from the pass are rather limited, but the rock and meadow scenery in the immediate environs is quite interesting, and there's a good view of glaciated Mt. Ball. The descent on the Kootenay Park side is steep in places, but the entire trail is well-maintained and travel is generally easy. About 5 km below the pass, a stream is crossed (fill bottles if you are ascending), and the trail continues through a cool forest all the way to the highway. The Larch section of the GDT begins at the Floe Lake trailhead and parking lot directly across the road.